The band, which was founded on Skye in 1973 and enjoyed UK chart success with Gaelic songs in the 1990s, are retiring after 45 years in the music business. 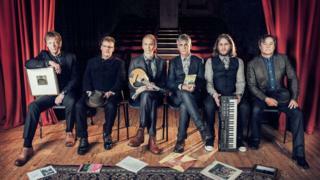 Runrig are to perform their last major events in Stirling next month. Loganair has added the extra return flights from Stornoway to Edinburgh and Glasgow on 17 and 19 August. Commercial director Kay Ryan said: "There has been an impressive level of interest from the Western Isles for Runrig's final shows this summer and we're working hard to ensure everyone has the opportunity to experience the farewell concerts. "In total there will be 150 extra seats available for people travelling to both the Friday and Saturday night gigs, as well as anyone who may need to make a last-minute trip to the mainland for family or business. "We have planned for our larger Saab 2000 aircraft to fly the extra Glasgow flights and an extra 33-seat Saab 340 flight to and from Edinburgh. Furthermore, we are also upgrading capacity on Benbecula services to the 50-seat Saab."